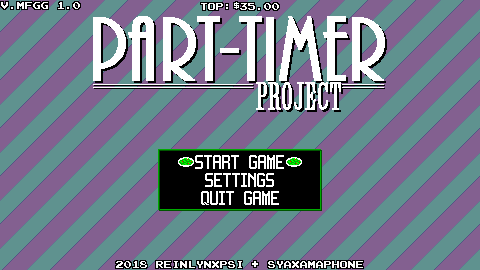 Part-Timer Project is ReinlynxPSI's and mine's 2018 minigame comp #1 entry, originally released February 17/2018. Take the role as a waitress fulfilling guest orders. memorize their order, send it to the kitchen and bring it to guests quickly for maximum tip bonus! People tell me it's a lot like Diner Dash. When a guest is flashing, they are ready to be served! Press A to greet and get their order, the food they want will appear over their heads. Use a computer to punch in the order for the kitchen to make. 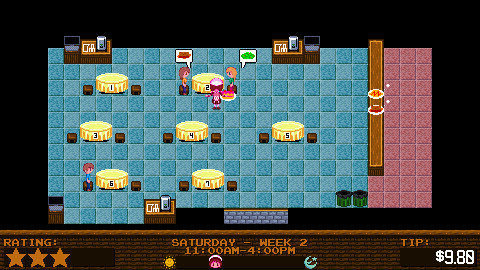 Grab completed food from the counter and bring it to the customers. Guests will often ask for water (or you can deliver it anyway for tip bonus). Clear a table after a guest is done with A. The game is over if you make too many mistakes or if you waste more food than money you made in a day. Delivering water early (before they wish to order) is a great way to get extra tip. If your hands are full you can put food in the trash or back on the counter. Food does not expire in your hands. Some food takes longer to prepare than others. Keep and eye on the kitchen queue to get an idea of how different dishes work! I forced convinced Syax to make a topic for this because it's a super-cute concept that deserves some more love. The Wario's Woods music was a fun little surprise, too! Oh right that game that competed with Collect the Cake Mario game I made and blew it out of the water... well at least i tried. I never got the hang of this game but i should really try it out again. From what I played it was fun.